Here we are again, another month and another billion PLUS dollars off the presses. 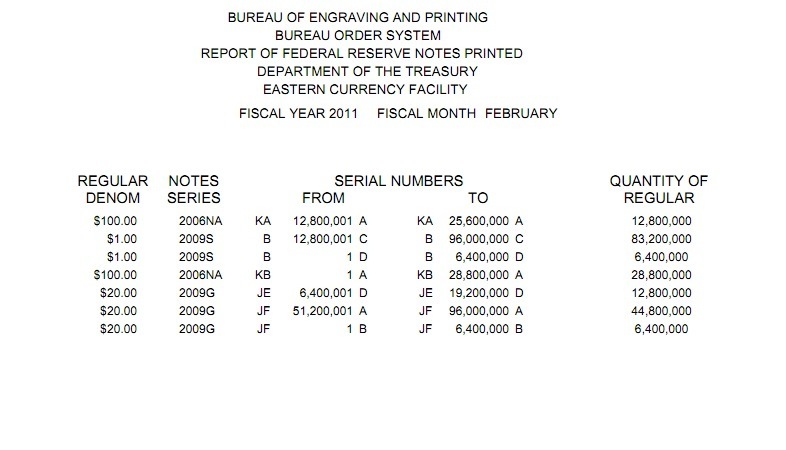 We have printed a grand total of $13,785,600,000. for the month of February 2011. The Eastern Facility printed $5,529,600,000 and the Western Facility printed $8,256,000,000. I have just started tracking this, but we blew the doors off of January. This brings us to a yearly total of $18,131,840,000 off the presses. Wow I could buy some serious bullion and rare coins with this kind of money! Established in 2003, the Citizens Coinage Advisory Committee (CCAC) is the “informed, experienced and impartial resource” of our United States numismatic future. While Congress must authorize every coin and most medals that the United States Mint manufactures, it is the CCAC that advises the Secretary of the Treasury on what our country’s future coinage will look and feel like. The CCAC submits a letter to the Secretary of the Treasury after each public meeting, next meeting being March 1, 2011. Their site has a great resource to view past legislation about the historical events and personal achievements Congress honors through the authorization of coins and medals. I subscribe to the Bureau of Engraving and Printing email list. I get some pretty random things, from the tour facilities will be closed because of a private party to this great piece of information. It is just really amazing that they print so much cash!